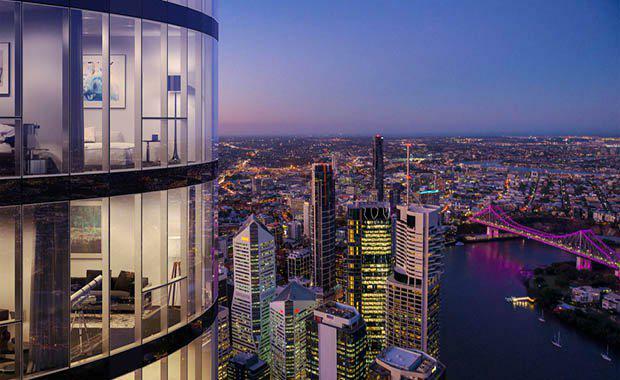 AMP Capital is looking to reduce its exposure in what is on track to be Brisbane's tallest tower – Skytower - that rises 90 storeys and will add another 1128 apartments to a market where there are increasing concerns of oversupply, The Australian Financial Review has reported. AMP Capital, which is in a joint venture with private developer Billbergia to build the 300 metre tower at at 222 Margaret Street, has been quietly shopping a major portion of its capital exposure to financiers including the big four banks. A deal is likely to be finalised within the next month according to The AFR. The AFR reports that apartment sales in the tower, which launched in November 2014, have been particularly strong. About 900 apartments or 80 per cent of the tower has been sold despite concerns of a growing oversupply in the market.